Server? You don't need no stinkin' server! 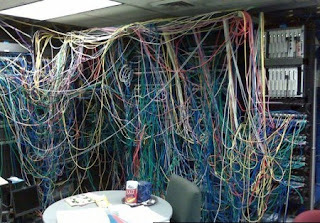 Ahh, the good old Server room. Makes me a little bit nostalgic for my corporate IT days. Repairing computers and networks for a nameless, faceless entity was so rewarding after all. Sure, and if you believe that, there's a Lake in Michigan I'd like to sell you. Anyway, before I get too far off topic, the one thing we see come up often in our Los Angeles-based computer repair business is the need to share data. For many years the way to most efficiently make this happen was, you guessed it, a server. To get a better idea of why you may need one, let me clue you in on just what exactly a server is. It's just a computer. It's a computer set up to share data. Yup, I said it. It's little more than that. In fact the servers of a few years ago are probably working with less horsepower than the budget-friendly laptop you're probably reading this blog on. Servers have some additional configurations and possible server-specific software running on them, but they're not some mythical supercomputer that can calculate pi (the mathematical version, not pie, the delicious dessert) faster than you can think it. More likely than not, a server is simply a computer just like the Mac or PC you use on a daily basis. As a matter of fact, if all you want is some simple file sharing, the Mac or PC you're using will do just fine. Today, there are a number of options for sharing files, and the traditional dedicated server is expensive and may be overkill. You can use peer-to-peer file sharing between computers, use an online file sharing service product, get yourself a traditional server, or go with my personal favorite - the server appliance or NAS. Peer-to-peer file sharing solutions can work well for a small office or household. Every operating system in use today - Mac or PC - will allow you to share files between over your local network. It's not the simplest process for your typical end-user and if the computer sharing the files is shut down, other users will not have access to those files. Also, it'll impact performance of the computer sharing the files. Online sharing solutions like Dropbox or Mesh give you the flexibility of sharing files online and remote access to your critical data. Yes, this is that "Cloud" thingie all the kids are talking about. What they don't give you is fast access to your data and if you've got bigger files, especially video, they're not the ideal solution. At least not until typical Internet bandwidth increases tenfold. A traditional Server will get the job done, but it requires a large capital outlay and can require some very complex configuration and user management. The ongoing costs and administrative overhead make traditional server far more burdensome than a small business need deal with. So that leaves the NAS, or Network Attached Storage. Basically, these things are like an external hard drive that plugs directly into your network. You configure users and shared folders via a web browser, and voila, you've got yourself a server. One that's less than a third of the price and a quarter the size of a traditional server. Another great feature of these devices is they can often support multiple drives to provide redundancy in the event of failure in a RAID configuration. 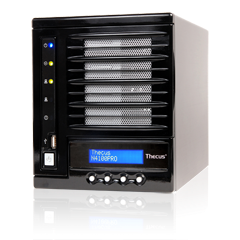 The typical one of these devices we configure for many of our customers is the N4100PRO from Thecus, Inc. Thecus is a leader in the SOHO NAS space and they've knocked it out of the park with the N4100PRO in terms of price and features. Supporting up to 4 hot-swappable drives currently giving you up to 8TB of available storage (with more likely supported in future firmware updates). It connect to your network via 2 Gigabit Ethernet ports and has native support for Apple, Windows and even UNIX. The device also offers a number of applications like web server, Time Machine server, iTunes Server, and has USB ports that can expand storage, function as a print server, or even back itself up to external media. Now I would be remiss if I neglected to mention the one killer app on this device: it has direct integration with Dropbox. Now while that's not the easiest thing in the world to configure, you can store data on this NAS that has redundancy in it's hard drive configuration, backs itself up to an external drive, AND synchronizes your most critical data and makes itself accessible via Dropbox. If you haven't thought about a backup strategy before, this device has it all. Done right, with this device, you'll not only be able to collaborate throughout your home or office with your family or coworkers, but you'll have the lowest possible risk of catastrophic data loss. So there you have it dear reader, the ten minute breakdown on why you may or may not need a server. It's not so scary (or expensive) as it once was and if you really need to share files, you can totally get away with not buying a thing or it costing you a dime. If you've got some more serious file sharing needs, well there are plenty of available solutions for you today with more and more on the horizon. Whatever you choose, it sure as hell beats carrying floppy disks around from room to room!